All the questions covered in sample practice exam are basic Project Management Professional Certification exam questions. To test your knowledge and understanding with the real-time case study based questions, we strongly recommend you to practice with our Premium PMI Project Management (PMP) practice exam. 2350+ Practical and Real-time Case Study Based Practice Exam Questions similar to actual PMI PMP certification exam and their correct answers for assessment. 2 Months Unlimited Access to online Project Management Professional (PMP) certification practice exam. We have a dedicated team of PMI certified experts who are having more than 12 years of experience in the field of Project Management. Our structured and autonomous review system collects feedback from recently certified candidates, based on those inputs our domain experts frequently update PMI Project Management test questions for practice. Our online practice exam is a simulation of the actual PMI Project Management Professional (PMP) exam that makes you familiar with actual exam environment and exam pattern. We offer unlimited practice attempts with our online practice test. Every attempt randomly populates questions from our premium PMI PMP question bank that contains 2350+ most probable case study based questions prepared by our domain experts. Practice questions will be served in random order with shuffled multiple choice answers to make your Project Management Professional exam experience more challenging. You can review the results of past practice attempts from result history and assess your performance. Such facilities are the significant advancement over questions in PMP PDF and far better than fraud dumps sites. According to our survey with PMI PMP Certified candidates, you can easily score 80% in the actual PMI Project Management Professional (PMP) exam if you can score 100% in our online practice exam. When i came to know that the PMI PMP mock tests here are designed by consulting PMI Project Management experts, i immediately became a premium member. It is difficult to find such PMP question banks. I relentlessly gave Project Management Professional mock tests. The questions are designed considering the weights of all the PMI certification exam syllabus topics for Project Management Professional. Unbelievable! Great combination, cheapest and best. 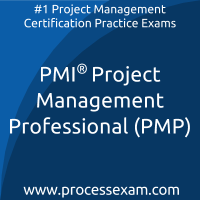 I achieved my target in PMI Project Management Professional certification, thanks to this site. Yes, finally...cleared PMP certification exam. this was my 3rd try and believe me, passing without practicing for PMI PMP Exam here was impossible for me. I had loose hope a while ago until my friend share his experience with processexam.com. I have gathered myself and decided to go for one more try. I passed the exam with got Target performance on all domains of the PMP exam. Thank you, I recommend to all who are preparing or planning for Project Management Professional (PMP) Certification exam.